For many, their college years are a time of discovery, which was certainly the case for me—albeit, a beer-fueled time of discovery. But once the beer got old, I realized I needed to find out who I am as an adult. How do I want to live my life? What do I truly enjoy? At the time, I was attending Cornell, and always had the yearning to be in the outdoors. So off I went trading in the Ivy for Alders and hedgerows in pursuit of upland game when not studying. 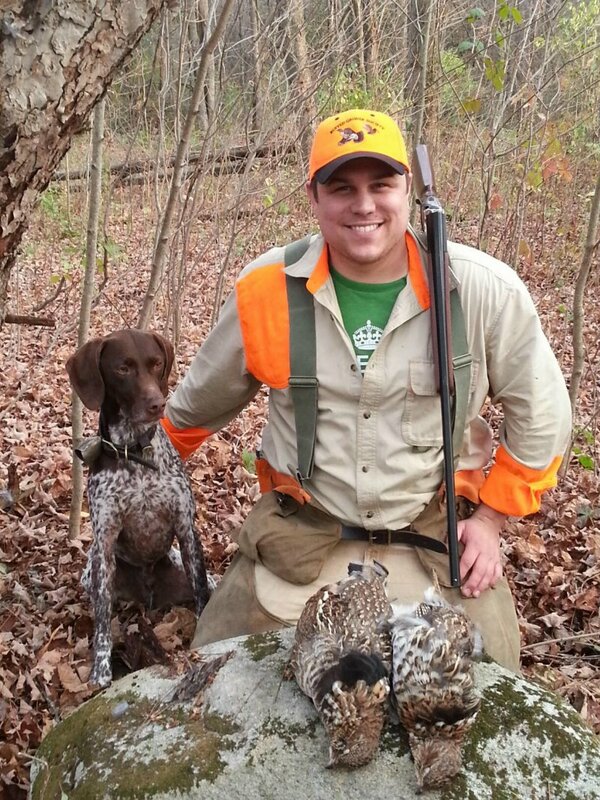 I had already spent a few years learning and mastering Waterfowl Hunting, and really wanted to pursue Upland birds. Naturally, I saw this as the perfect time for my now fiancé, Erin(who I was only dating at the time) and I, to get our first dog together. After finally convincing her, we did some research and found a German shorthaired pointer puppy with a decent pedigree that was within our college budget. Much to my chagrin, my first bird dog grew up to be a short statured 42 lb male who I contend was ruined by Erin babying him—to this day he still sleeps under our blankets and will snort at you rudely until you lift the covers and invite him in. Liam’s prissiness also tends to carry over into the field. Tall, wet CRP grass.. Forget it! Liam will make YOU forge a trail! 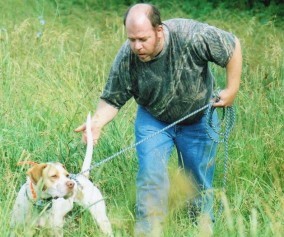 As you may imagine, he was never much of a grouse dog. 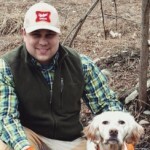 While finishing my degree, Liam and I pursued stocked pheasants, a quarry that was easy to find, as NY’s last remaining pheasant farm is in Ithaca, and a beautiful Pheasants Forever sponsored release site was within a 20 minute drive. 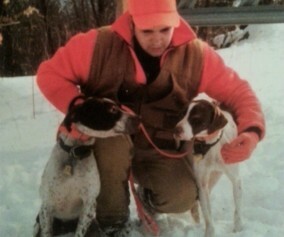 Stocked pheasants, with their proclivity to sit tight despite heavy pressure from a dog also provided a great opportunity for two green upland hunters to cut their teeth. While this tendency made them great for a young dog to break in his nose, it also laid the foundations for a terrible grouse dog! 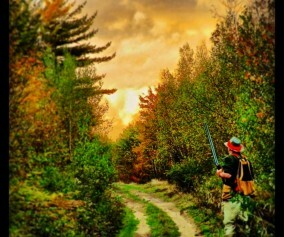 Since the first time I had a grouse flush from under foot while deer hunting, I knew I wanted to be a grouse hunter. 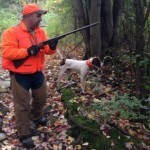 Equipped now with a dog who had proven himself on pheasants, I decided to see how we might do in the grouse woods. A small patch of state lands was located five minutes from the dingy barn loft turned apartment that we rented during our last year in school. Taking a senior course load (read 12 credits, with classes 2 days per week), Liam and I had plenty of time to hit those woods. I swear, that dog could locate a grouse ANYWHERE, though I soon learned he had a predilection for a game I like to call “flush every grouse.” Alas, our first 3 years of chasing grouse, he flushed every single bird 50 yards ahead of me. 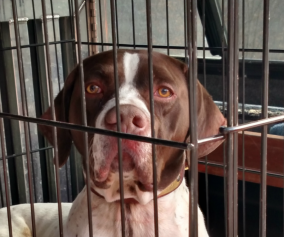 I suppose the moniker of his breed—German shorthaired pointer—was a bit of a misnomer! Enter Gus in the fall of 2013—English Setter who was going to be the answer to my grouse hunting prayers. 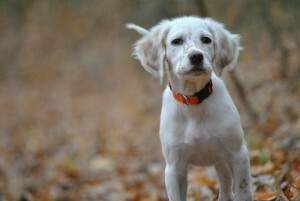 Little did I know that setter puppies are a far cry from GSP puppies. Gus tested my patience daily but he had the exact amount of boldness and independence that I desired, a puppy that had the potential to become the hard charging, ground covering, no nonsense grouse dog of my dreams. 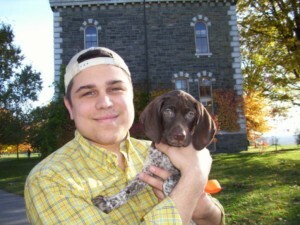 From day one, Gus got the upbringing that Liam never had; grouse contacts galore starting at 12 weeks old and plenty of woodcock exposure when they returned to NY during Gus’ first spring. By his first full hunting season, I thought Gus would tear the woods up, and he certainly did! He tore up every inch of woods in front of him, finding and flushing every grouse and woodcock hundreds of yards ahead of me(to his credit, he runs beautifully and he did show me some nice flash points). Many a hunt with Gus ended with my frustration over the amount of puppy still left in him. While Gus and I hit the woods, Liam would whine in the car, the look on his face said, “Please! No! Choose me!” So after putting Gus away, as a last ditch effort to put a grouse or two on the table, Liam and I would hit the woods. Liam got his chance to shine, it was now or never. You can only imagine my surprise the first time I let Liam out of the vehicle and he slammed a grouse point just feet into the woods! And he held it, and I flushed the bird! From that point on, Liam was on fire. 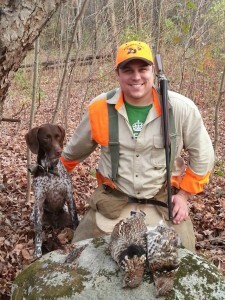 Over the course of the season, I had the opportunity to see him point dozens of grouse and woodcock, and though I let him down often, I connected enough to keep him rewarded with the occasional retrieve. Giuseppe Papandrea will attest to it, Liam became the little shorthair that could! My experience with Liam makes me pause and wonder. Is it maturity that makes a grouse dog? Exposure to hundreds of birds? A combination of both? Or is it some serious competition from a youngster that turns the underdog from a zero into a grouse hero? For Gus, only time will tell… He just might need the kick start only afforded by the addition of another pup to the pack. Until then, he’ll continue to earn his keep with slobber-filled kisses and the promise of what’s to come next season. Great story that many of us can relate to. Pheasants will screw a dog up in more ways than one thats for sure. I finally decided no more pheasants for my setters a couple years ago and they have only improved in the grouse woods because of it. How was the big move? I agree with you 1000%…I had Fatso on Phezs this winter during upstate big game…I’m on Long Island and the bird season is open here during deer season, so I went…big mistake..He was flagging every bird. Sam put a nice piece together and going to be a solid contributor to the Mob. This was a great piece. Let me know when you get settled or get the itch…Mob needs you to make your bones! Will do, but for now… still packing and painting… the sellers of our new house can’t get their movers in for another week… I hope this all gets sorted out by hunting season. Pheasants were definitely a fun way to cut my teeth… I can’t say with any certainty if I would have stuck with upland bird hunting if I had started with grouse. I can imagine it would be easy for any new bird hunter to give up hope when presented with such difficult conditions and so few rewards. With that said, my boys and I only went pheasant for one hour this year, decided it was too easy, and traded the the cornfields for gnarly apple orchards. We had very familiar experiences while attending Cornell in the late 60s! Only back then there were wild pheasant out in Trumansburg on the west side of Cayuga Lake and more than enough grouse in the whole southern tier past Dryden. I think our class attendance slipped below the 50% mark our senior year, plus we had the option of duck hunting right off of our dock turned duck blind ! Halcyon days indeed so close to Cauugas waters ! I’m sure Sam will check this later when he comes on. I will formally Intro you guys on an email. I’m sure you guys can share some stories of Cornell and Setters. Glad you came on to check us out! 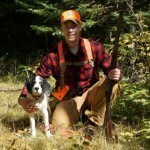 Ed, it really is a great area to attend college if you’re an outdoors enthusiast. 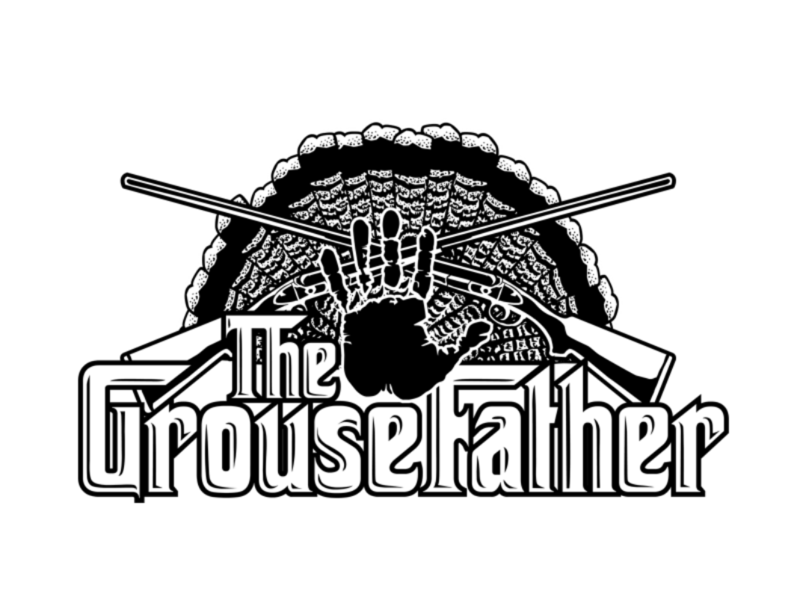 Between goose season in September, pheasants and grouse in October and deer season in November, I’m lucky if I made it to 30% of my classes senior year, even though they were only twice a week! 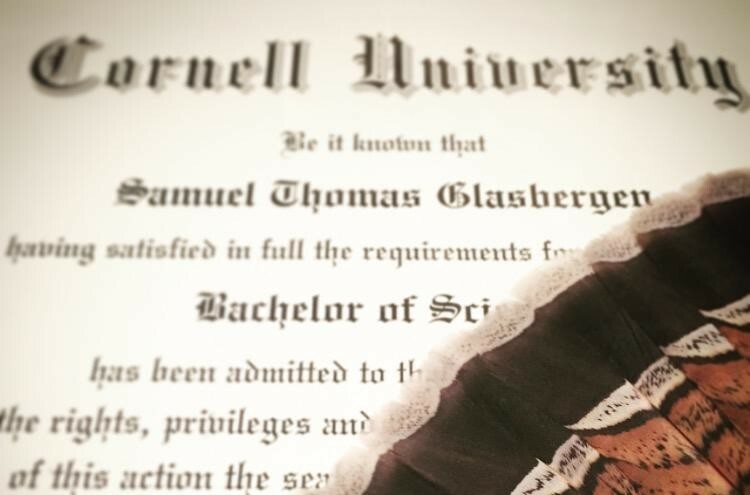 Add in fly fishing the Cayuga lake tributaries during the Spring and it’s amazing that I was able to graduate! I would love to hear stories about the glory days around Ithaca some day! Great write-up Sam! You’re senior class scheduling sounds a lot like mine when I was was attending Minnesota-Duluth. When your only obligation to be on campus is two days a week that leaves a LOT of time left to spend in the woods! What a blast!